I received this email as Kathleen (Welcome to Pigeon Angels ) is unable to post. 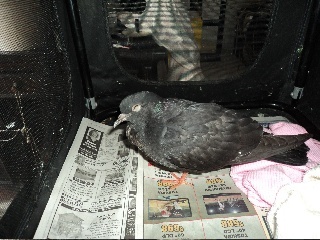 Hi I am new to this forum because i just rescued a simon pigeon that fell from the electrical lines. And no one in Louisiana will help him. So i kept him. He had a really messed up eye but it seems after a few days it has become okay. 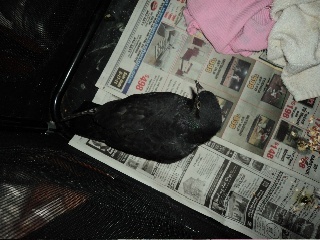 He is now eating and drinking (wild bird feed I give him and water) and I have him in a cage. But he cannot fly. One of his wings are messed up I can't seem to post anything on this forum so I just thought I would find a moderator who could help me. All the wildlife and fisheries told me was to leave it outside because it was probably diseased or something. But I don't think it is. * The lady said if it was light to pick up it was diseased which made no sense to me. If Simon is ill, you needn't worry about catching anything. * He is mostly likely 'light' because he was starving and severely dehydrated. The fact that Simon is eating and drinking is great news. If you would, please gently open his beak and check for any obstructions. The inside of his mouth should be nice and pink. The central air should be OK as long as you don't put his cage right under one of the vents. Ideally, his cage should be placed in a quite room away from human and animal traffic. It is true that pigeons need sunlight, however when dealing with an injured or ill one they need to be confined to a quite place until something is established about his condition. This is also the best way to observe them. A photo or two would be great. I know you mentioned you were having a problem posting (I'll try to figure out what the problem is). In the meantime if you could get a couple photos (A full body picture, one of his wing and one of his drioppings) and email them to me, I will see if I can't post them. If the pigeon hit a wire it's very likely the wing is broken or dislocated, especially if he can't raise it. I agree with Kathleen that she shouldn't be trying to bandage it if she's so new to pigeon rescue that at first she couldn't tell which wing was injured. Wing bandaging is a tricky procedure -- if the broken bones (if they are broken) aren't lined up properly, a bandage can do more harm than good. And to know if they are lined up properly, usually requires an X-ray. $$$ If the wing is dislocated, bandaging is not recommended. We don't have any rehab contacts for Louisiana. I wonder if her location might be close to the border with another state... It would help to know which part of Louisiana Kathleen is in. (I'll try and see if I can find someone in another forum that is local to her and could help). We know for a fact that pigeons can live indoors, but of course a little sunshine is very necessary for their health. I don't have air conditioning, so I can't say if it's bad for the birds, but it seems to me to be a lot better than the vicinity of the neighbourhood cats! I think Kathleen has been coping very well with this new and difficult situation. It's impossible to know if Simon will fly again, I mean my George never broke his wing, only tore some ligaments, but he can't fly at all. Others have recovered completely. Is Kathleen willing to keep him as a pet? We could direct her to very successful examples, notably Revati's blog -- Elmo is flighless, but he has a full and very happy life with his human friend! I think Kathleen rocks! In the face of so much lack of support and fearmongering about 'diseased pigeons', it is to her credit that she went with her heart and the desire to extend a helping hand to a little soul who needed her. And now I'm off to see what I can dig up! PS. I wonder why she couldn't post... only thing that comes to mind is she might have tried posting in a locked forum. PPS. Just saw your post, answering several of the points I made as well. So sorry about the repetition. Photos WOULD be great!! I actually meant to ask if there was any indication of Simon connecting with a 'live' wire. You are right, there may be other factors of causing him to go light. My first thought though, especially this time of year (it's 111 degrees here right now and in Louisiana it can get pretty hot as well with added humidity) is dehydration. Of course nothing can be ruled out at this point. It's just so disturbing when someone is told a pigeon is most likely 'deseased' when the one giving that information doesn't even take a few minutes to evaluate the situation, only because they don't want to help them. In the face of so much lack of support and fearmongering about 'diseased pigeons', it is to her credit that she went with her heart and the desire to extend a helping hand to a little soul who needed her. Given what Simon has gone through, I don't think his 'poops' look bad. Simon, you are a little sweetie and we will do everything we can to help Kathleen help you. Thank you everyone for helping me. I'm so glad i have some support. Yes it was a live wire because the neighbor said it sparked. I don't mind spending the money on the pidgeon to fix his wing if that is it. I just need someone to help me find someone who will take it and fix it. I have 8 bichon dogs and a golden retriever so yet another animal is definetly not a problem. I would just prefer that I could fix him and he could fly and be with his friends. A caged bird is not something I want to see ever. Glad you are now able to post, Kathleen. Simon really did take a hit, didn't he? Bless his heart. He's fully alert and doesn't appear to be in shock? Oh my goodness, poor pigeon! I never asked if it was a live wire, because I didn't expect him to be alive if that was the case. As it was, he must have sustained burns from the contact with the wire, and those may be visible or internal -- or both. Kathleen, is there any sign of superficial burns on the right wing? If you don't see any and he isn't too sore, could you please 'comb' the down feathers away from the skin, and see if you can find any signs of burning or any wounds on the skin? I agree that his poops are not too bad, considering. 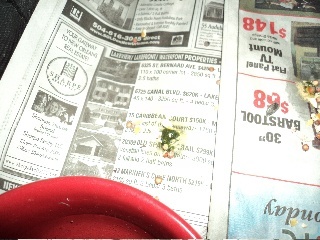 On the last photo, however, they look quite a bright green, like starvation poops. If this photo was taken before the others, then there is progress, but if it is the other way round then we can't rule out that there may be some internal damage. I hope not. Kathleen, which part of Louisiana do you live in? Kathleen did say the poops were a lawn green coloring . I need to clean my glasses as I thought they looked on the brownish side. I just found this link to a list of rehabbers in LA. I hope this helps. There are several that take birds, but they aren't in New Orleans. If there are any that may be of interest, please ask them what their policy is on euthanizing. Hi Im not really sure which wing it is. He seems that the left wing moves freely around around and the right one he keeps close to his side. So I presuming it is the right wing. I don't see any burns on it but he really doesnt want me to get up under that wing and look. Nothing visible on the outside of his wing though. Well the neighbors said it sparked but I'm not sure of that. Let me look up this site and see if this could help me. Thank you so much. Yes his poop is green and white but he wasn't eating at all the first few days after this and I thought he would want some bread and he ate a little but not much. It's just in the past two days that he has been eating and drinking. I hope that Dr. Rich will be able to help. 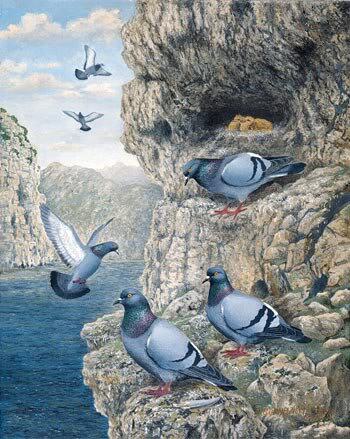 Abandoned or runaway domestic pigeons and their descendants learned to live alongside us and became known as feral pigeons. These are the ones we see in parks and on the street, and it's the kind you rescued. Many ferals look very similar to rock doves, but others can have a great variety of colours and patterns. Feral pigeons are neither a wild species nor pets, so they fall outside most of the laws that protect one or the other. That's why it can be so hard to get help for them: wildlife sanctaries and rehabbers' licences don't cover ferals, so IF they agree to take them, they either release them asap or, if that isn't possible, they put them to sleep. And many vets only treat pets. So, in order to get treatment for your beautiful bird, so neglected by society, you may need to tell the vet he is a pet. 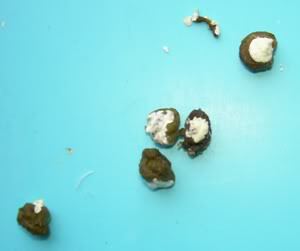 Bright green poops that look like dabs of artists' oil paint are starvation poops, indicative of the lack of solid component in the poops -- the colour, the 'greasy' look and the white and liquid components indicate that only bile and urine are being expelled. I believe that this is the case with your pigeon, as he was refusing food at first -- and no wonder, poor bird, he must have been very shaken and unwell! If this is the case, they should start to look more and more like the picture I posted as he gets enough food. If there is no improvement and he's eating well, bright green droppings normally indicate bowel disease. What is really good news is that his poops aren't small and black, as that is usually associated with internal injuries. Green, green poops are definitely not a good sign. I will be thinking positive thoughts that you are able to contact Dr. Rich (or someone) who can assist you and Simon, Kathleen. Kathleen, your compassion towards your little patient is a blessing indeed! Like you, I wouldn't want to hand a bird with a decent chance of healing over to someone who might not try 150% to care for him. 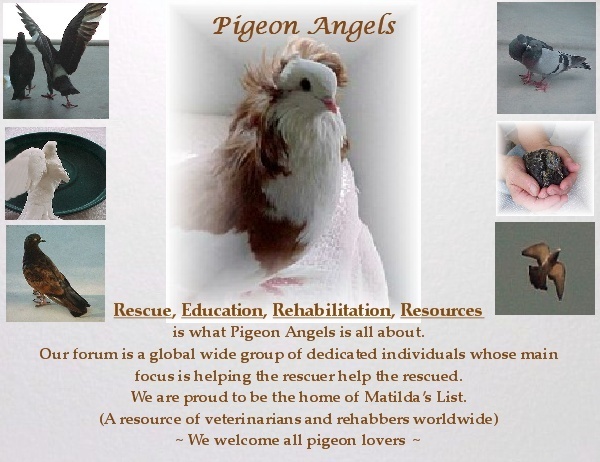 So, here's another thought, how about trying a veterinary hospital and saying you want to keep the pigeon as a pet? Being officially considered a pet would almost certainly be more costly, but you would have complete control over what happens to him and how he's treated. And then, when he's been treated, you get to take him back home. It might be the best option, as what you really want is for someone to find out why he doesn't move one wing and, if necessary, bandage it, and to check for any electrical burns. None of that should turn out very expensive. I had a look at vets in New Orleans, and this one claims to charge reasonable fees and to be very compassionate: http://www.southernanimalfoundation.org/ I also had a look at their Facebook wall, and their customers are full of praise for them. Thank you so much for the update. It's good to know that the rest is doing him good, and that very soon you will have your car back and should be able to take him to a vet of your choice! Now, I don't want to panic you, but most stories of pigeons who survived an encounter with a live wire ended up badly. What happened is that there were electrical burns to the wing(s) and feet that were difficult or impossible to see for anyone who isn't very experienced. Those burns can lead to gangrene, and if the area affected isn't treated (or amputated, if some time has passed) then the bird will die. I'm sorry to be telling you bad news, but it's clear you are very fond of your pigeon and want the best for him, so I needed to alert you to be vigilant of areas where the skin is discoloured or feathers are falling off, because that will need immediate attention. Yes, I'm in Portugal, and usually we have very good weather -- the Atlantic cools our summers and warms our winters. And a/c consists of 3ft stone walls and window shutters! Very effective! But yesterday we had freak weather: in the evening, the south wind was blowing so hot that when you went to the window it felt like standing in front of an open oven door! The wind blew in the mesh screen in the veranda and freaked my pigeons. I had to shut everything until 11.30pm, when things got back to normal. We so appreciate your update. I know it's hard needing to keep Simon confined, but it really is best for him for the time being. Just like us humans, when we are not feeling well, rest, hydration and good nutrition is what's needed to help in our recovery. It's wonderful that he has accepted some 'veggies'. As Teresa mentioned, keep an eye on Simon's skin and feet for anything that seems amiss. Monitor his food/water intake and his poops and you've done the best you can. Continued positive thoughts and get well wishes to Simon are being sent your way. Did you have any luck with the vet? Simon passed away last night. 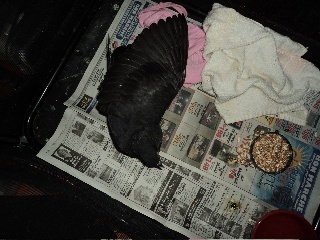 After the Dr. told me to leave him in a dark quiet room so his wing would mend I did. And I think he died of lonliness. I should have kept putting him in the sunshine and letting him walk around. I don't know he was fine yesterday and I found him passed away today. I was very upset. Kathleen, I am so very sorry to hear that Simon passed away. I honestly don't think he died of lonliness. Simon had a traumatic event happen. And none of us know what might have been going on internally. I've had this happen more times than I care to remember. It's heartbreaking to say the least. Please remember though, had it not been for you, Simon would have died alone on the street. Instead, he was able to experienced the love and compassion of a human. You did everything right, Kathleen. "May you forever fly high and fly free sweet Simon." Oh Kathleen, I'm so sorry! It's so heartbreaking to see a little friend die all of a sudden, just when he seemed to be getting better. There was nothing more you could have done for him, and putting him in a dark quiet place would have been very calming for him and would have allowed him to rest and give his body the chance to recover. I do that often with mine, in fact I have two at the moment in quarentine, and they're doing OK. You can be sure he didn't die of loneliness, and you didn't do anything wrong. If you've heard any stories of people who got hit by lightning, the worst problems are the electrical burns and internal organ damage. From the way he passed suddenly, it's very likely his heart was affected by the electric discharge and was left prone to stopping at a moment's notice. It's so very sad, but you can be sure he didn't suffer. And he got to spend some time with a caring friend who showed him the meaning of love, protection and safety. Wherever he is now, he'll have taken with him gentle memories of a very special human. So long, dear Simon, fly free! We won't forget you!